Home to more than 2.3 million people who speak at least 150 different languages, Queens is heralded as the most multicultural place on Earth. People go there to watch Major League Baseball or the U.S. Open. Perhaps they venture just across the river from New York City to check out a trendy new restaurant, bar, or performance space in Long Island City or Astoria, or ride the train all the way out to the beach on a summer's day. Adrienne Onofri is a native New Yorker who's lived in Queens for the past 25 years. 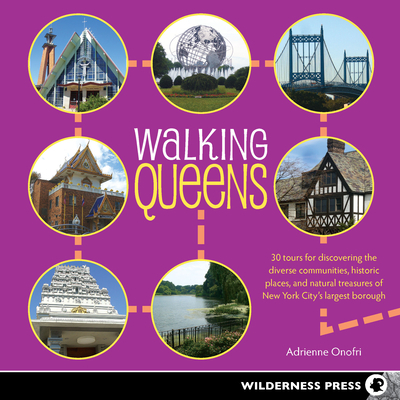 Her previous book, Walking Brooklyn: 30 Tours Exploring Historical Legacies, Neighborhood Culture, Side Streets, and Waterways, helped launch Wilderness Press' urban trekking series. A licensed NYC sightseeing guide, Adrienne has led tours in Queens, Brooklyn, and Manhattan by foot, bus, car, and trolley. She has been a staff editor at several travel industry publications and is currently a freelance editor for national consumer magazines. She is also a theater writer and member of the Drama Desk.